Vancouver, Canada — Mawson Resources Limited (“Mawson”) or (the “Company”) (TSX:MAW) (Frankfurt:MXR) (PINKSHEETS: MWSNF) announces positive drill results from the first five diamond drill holes reported in the 2018 winter program at the Company’s 100% owned Rajapalot Project in Northern Finland. Drilling with three rigs continues 24/7 with additional rigs planned to be added to the program over the coming weeks. A plan view of the drill results is provided in Figure 1. Cross and longitudinal sectional views are included in Figures 2-5. Tables 1-3 include all relevant collar and assay information. Assuming a predominant stratabound control, the true thickness of the mineralized interval is interpreted to be approximately 90% of the sampled thickness. 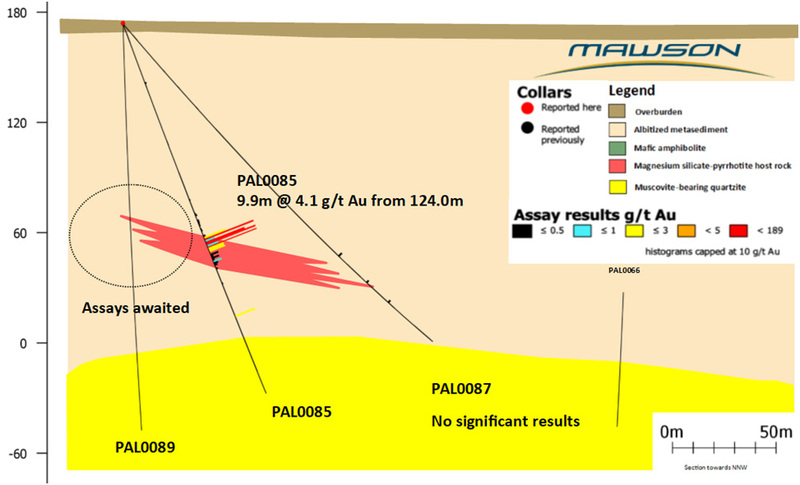 Many grains of visible gold were recorded during core logging of PAL0085, PAL0091 and PAL0093. Quality control duplicates for all holes show good repeatability of gold assays. 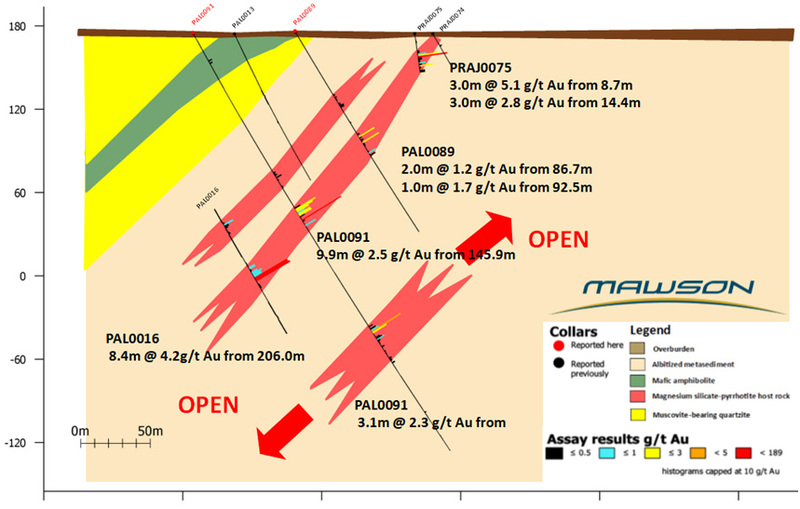 Intersections are reported with a lower cut of 0.5g/t gold over 1 metre lower cut, except PAL0091 and PAL0093 where 3 metes @ 0.5 g/t gold lower cut was employed. No upper cut-off was applied. These drill results support the discovery of a new coherent mineralized body at the Raja prospect (ie PAL0093 31.7 metres @ 8.4 g/t gold from 244.1 metres) which has now been traced 300 metres from surface with mineralization unconstrained laterally and down plunge. Drilling at Raja is now focusing on testing consistent cross sections along the extent of the body to extend the mineralized footprint. PAL0087, drilled 90 metres ENE of PAL0085 at the present easterly extent of Raja, did not intersect significant mineralization and infill drilling on this section is required to better define the controls on gold mineralization. At South Palokas broad lower grade mineralization has been discovered for the first time in the structural footwall (PAL0091 3.1 metres @ 2.3 g/t gold from 248.6 metres), as well as intersecting known mineralization in an upper zone (9.9 metres @ 2.5 g/t gold from 145.9 metres). PAL0089, drilled 70 metres up-dip from PAL0091, intersected low grade mineralization (2.0 metres @ 1.2 g/t gold from 86.7 m and 1.0 metres @ 1.7 g/t gold from 92.5 metres). It interpreted that PAL0089 did not drill deep enough into the structural footwall to test the mineralization subsequently discovered in PAL0091. Further drilling is required to establish controls and extensions of the South Palokas mineralized system. Mineralization at both Raja and South Palokas is different from the Palokas prospect and consists of sulphide (pyrrhotite>>pyrite), magnetite, biotite, muscovite and chlorite hydrothermal mineral assemblages hosted in predominately grey albitites. Textures range from veined albitic granofels through fractured and brecciated to locally schistose. Veining and fracture fill minerals include pyrrhotite, magnetite and magnetite-pyrrhotite (+/- quartz). Local retrograde chlorite after biotite and vein-controlled chlorite+/- tourmaline and magnetite are also present. Preliminary hand-held XRF analysis confirms the presence of associated scheelite and molybdenite, the former visible under UV light as tiny veinlets and disseminations. The iron-rich nature of the mineralized rocks is a common theme in either the oxide or sulphide form, with a variably sulphidic and chloritic overprint. The alteration is clearly post-metamorphic, reduced, and most likely driven by granitoid intrusions. Chlorite is regarded as the lowest temperature silicate mineral with gold, structurally controlled in apparent spatial association with quartz and/or K-feldspar veins. Altered rocks enclosing the mineralized package contain locally abundant talc and tourmaline. Three diamond drill rigs (K1 & K2) from the Arctic Drilling Company OY (“ADC”) and MK Core Drilling OY (“MK”), all with water recirculation and drill cuttings collection systems were used for the drill program. Core diameter is NQ2 (50.7 mm) diameter core. Core recoveries were excellent and average close to 100% in fresh rock. After photographing and logging in Mawson’s Rovaniemi facilities, core intervals averaging 1 metre for mineralized samples and 2 metres for barren samples were cut in half at the Geological Survey of Finland (GTK) core facilities in Rovaniemi, Finland. The remaining half core is retained for verification and reference purposes. Analytical samples were transported by Mawson personnel or commercial transport from site to the CRS Minlab Oy facility in Kempele, Finland. Samples were prepared at Kempele and analyzed for gold at Raahe using the PAL1000 technique which involves grinding the sample in steel pots with abrasive media in the presence of cyanide, followed by measuring the gold in solution with flame AAS equipment. 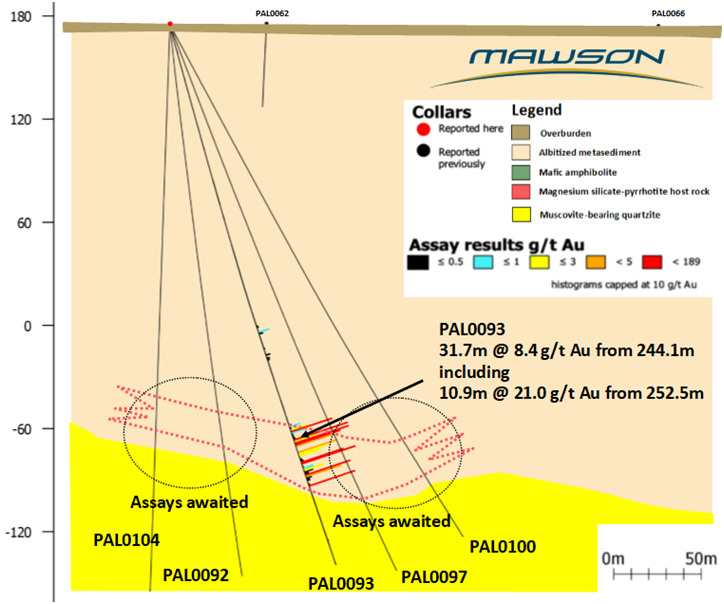 The QA/QC program of Mawson consists of the systematic insertion of certified standards of known gold content, duplicate samples by quartering the core, and blanks the within interpreted mineralized rock. In addition, CRS inserts blanks and standards into the analytical process. Figure 1: Plan of Rajapalot showing historic drilling, new results and location of cross sections in following figures. Figure 2. Section showing new results from drillhole PAL0093 from Raja, Finland. Figure 4. 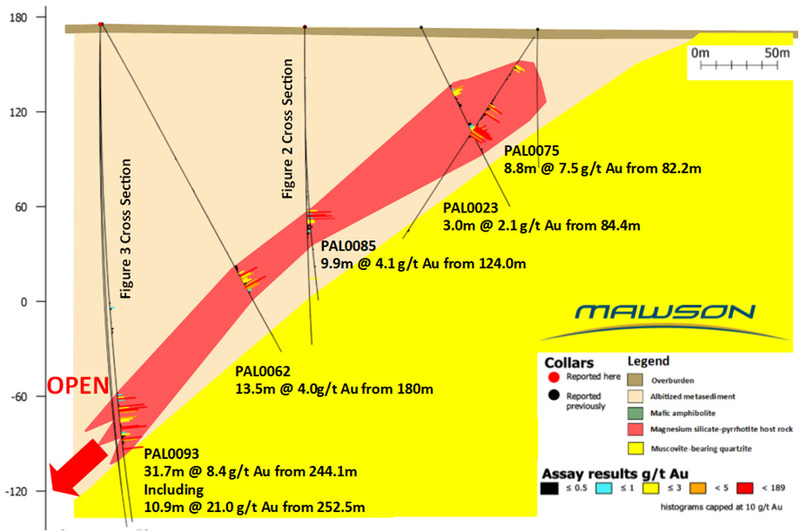 Longitudinal Section showing new results from drillholes PAL0085 and PAL0093 from Raja, Finland. Figure 5. Cross Section showing new results from drillholes PAL0091 and PAL0089 from South Palokas, Finland. Table 2: Better intersections from the 2018 Winter Drill Program. Intersections are reported with a lower cut of 0.5g/t gold over 1 metre lower cut, except PAL0091 and PAL0093 where 3 metes @ 0.5 g/t gold lower cut was utilized. No upper cut-off was applied.